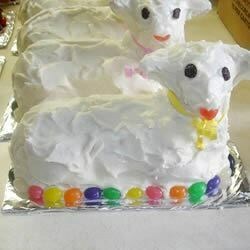 "Lamb cake, for Easter or someone special. My Grandmother used to bake this special cake just for me for my birthday each year, since my birthday usually falls close to Easter each year. This tradition started on my first birthday, now the tradition has continued onto my daughter's birthdays." Prepare cake mix according to package directions and bake in two halves of a stand-up lamb cake pan. Cool completely. Stick the two halves of the lamb together using white frosting. Sit the lamb up and frost the entire lamb. Coat the entire lamb with coconut. Decorate with jelly beans for eyes, and licorice for whiskers. Tint any remaining coconut with green food color and use as grass. nice. It was tasty and good. My family liked it.